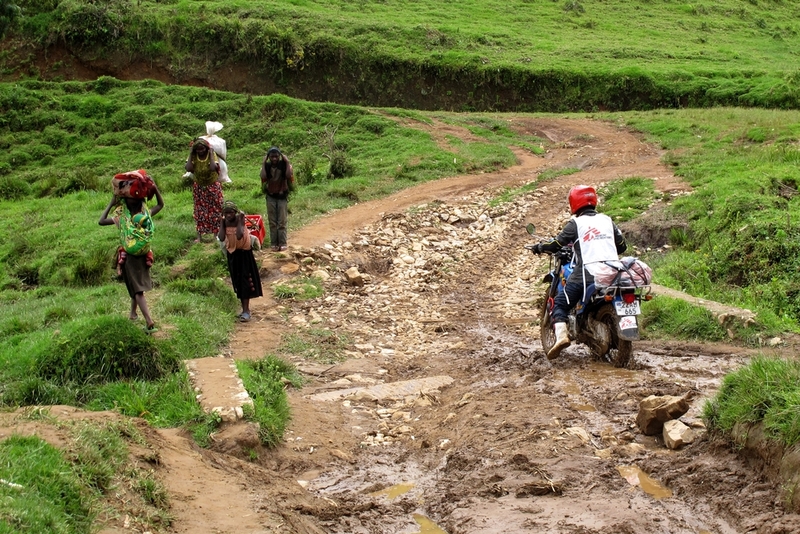 A network of motorcyclists makes it possible for Médecins Sans Frontières/Doctors Without Borders (MSF) to assist people in remote areas Democratic Republic of Congo (DRC). Travelling from Minova to Numbi, in eastern DRC, would be a dream for any motorbike enthusiast. With more than two hours of slopes, slippery surfaces and obstacles of all kinds, the journey is a test of skill that many local motorcyclists overcome with ease. As a passenger on the back of the bike, admiring the beautiful scenery is challenging as the difficulty of the route requires the driver to perform motoring acrobatics. But after a while, the incredible skill of the drivers becomes apparent and the passenger is willing to go wherever necessary. The bikers must support each other to cross the muddy terrain to Numbi. For thousands of inhabitants of Numbi and the surrounding highlands, these motorcycle routes are practically the only means of getting to Lake Kivu and the nearest city, Minova. And for a sick person or a pregnant woman, they are a gateway to the only hospital in the area. "I have never encountered an impossible situation, you always find a way. 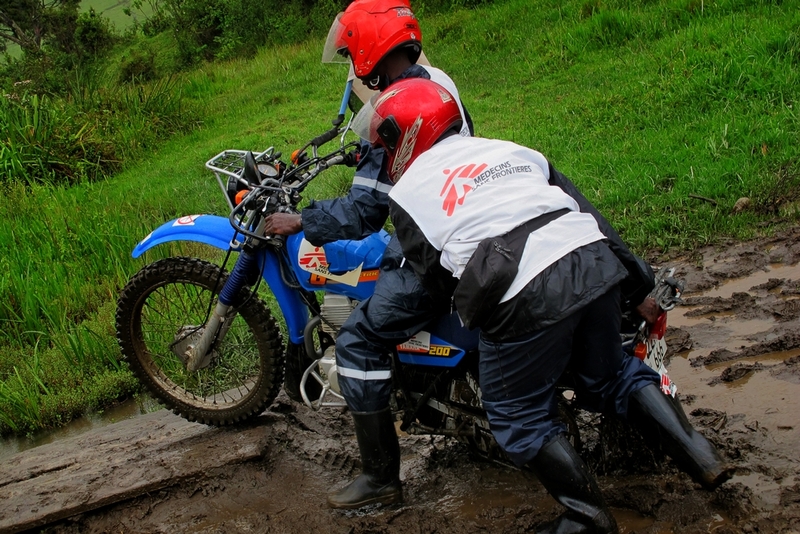 But sometimes you have to cross yourself before accelerating," explains Shabadé, one of the motorcyclists working for MSF in the province of South Kivu. Whether for assessments to detect the needs of people in remote areas or as a service to transport patients, these bikers are essential in bringing medical care to tens of thousands of people who would otherwise go without. Lack of access to healthcare is a major problem in DRC, a country that has less than one hospital bed per thousand inhabitants and slightly more than one doctor per 10,000. These statistics are among the worst in the world. “It's a lot of pressure because you have to go fast but also carefully because you are driving people in a delicate situation,” admits Akonkwa, an MSF mortorcyclist in Numbi. Last September, a grenade blast injured a dozen people just outside the headquarters of MSF in that village. The motorcyclists had to urgently evacuate several of the wounded to Minova, some of whom had very serious injuries. But sometimes not even the expertise of these motorcyclists is enough to reach the health centre in time. “Recently we were driving a pregnant woman to the hospital but she started to have the baby. Luckily, the guy on the support bike had some experience and we were able to help the woman to give birth. Everything went well,” recalls 22-year-old Brimana, one of the newest members of the group of MSF motorcyclists in Numbi. To manage routes like the one from Numbi to Minova, which cars only travel in extreme cases – and never in the rain, MSF has consolidated its network of motorcyclists with local young men, many of whom have made their living as part of the country’s vast network of ‘mototaxis.’ Like Shabadé and Brimana. “Six months ago, I was hired one day by MSF to transport a patient in an emergency. Apparently I did well and they offered me a steady job. “I passed a test and here I am,” explains Brimana. He recognises that he makes a better living with MSF. "Before I had to pay rent for the bike I used as a taxi,” he says. “I feel like I’m progressing. This job teaches you much more as a person and gives you a better understanding of the society you live in," he says. 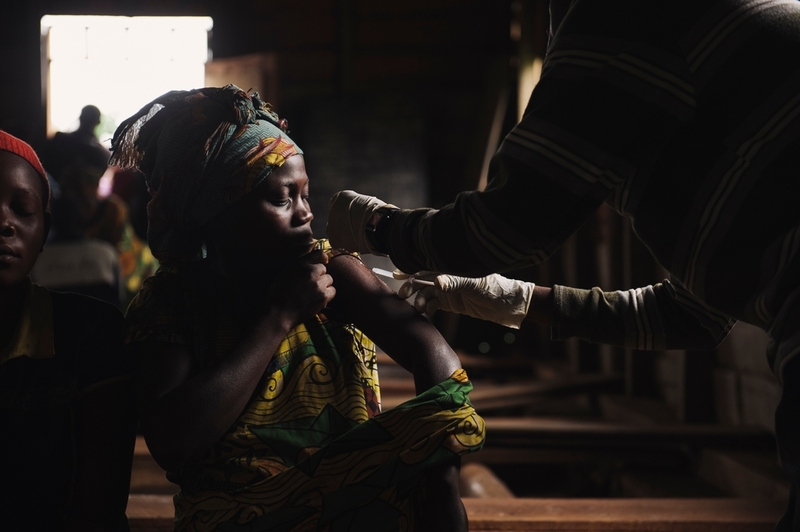 A pregnant lady is vaccinated in the village of Kitobo II in Masisi territory in the east of the Democratic Republic of the Congo on August 14, 2014. The difficulties of the road are not the only ones faced by these ‘bikers without borders’. Like many other civilians, they often have to deal with the conflict that has plagued various parts of the country for the least two decades. “Once we were on an assessment in the south of the province and militiamen stopped us at a roadblock. 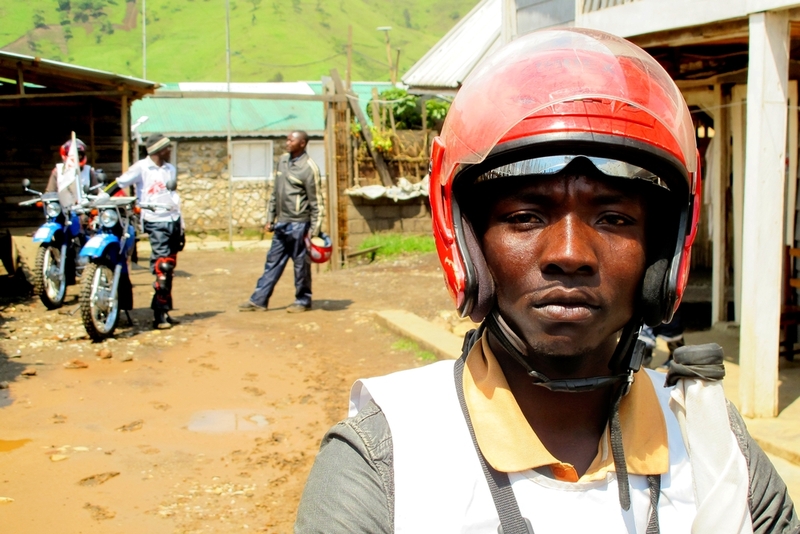 Things got ugly and we had to flee as they shot into the air,” recalls Pascal, one of the motorcyclists of the MSF emergency team based in Bukavu, south of Minova. The motorbikes are an essential part of many operations in the region, such as the frequent vaccination campaigns in which the only way to take vaccine containers deep into the jungle is on two wheels. “Sometimes the bike carries a load of 150 kilos, which is a lot,” explains Pascal. Thanks to the bikers there have been several immunisation campaigns in the area. Hundreds of thousands of children have been vaccinated against diseases like measles, which can still be fatal in DRC. Without these men on wheels, this part of remote DRC would be a very different place.